The Democrats are so desperate to win elections they willingly throw every element of our Constitutional Republic under the bus. The first thing we have to realize is the Democrats can only win elections by exploiting and creating minority groups that they can manipulate into direct opposition to Republicans. I call this opposition politics. I define this as a sophisticated use of government programs and propaganda campaigns to radicalize civilian groups against their political opponents. Here is the quick and dirty, non-PC rundown of the absolutely immoral and often illegal tactics the Democrat Party implements during any given election season. The troubles among typical black communities is a result of their voting Democrat for over 100 years. The neo-plantation masters within the Democrat party have mercilessly exploited these inner city communities. They have become especially easy to mobilize over the years because of their reliance on welfare programs, and government assistance. Simply tell them Republicans will vote their welfare away and they are Democrats for life. On top of this due to the militarization of police by the DHS in these inner cities, blacks are being targeted and shot at an alarming rate. Obama for 8 years could have at anytime ended the military style training inner-city police receive and put in place extreme penalties on cops that unjustly shoot black youths. He didn’t stop this because this gave the Democrats the power to create massive grassroots protest movements like Black Lives Matter they then can set in opposition with Republicans for years to come thanks to the financing of George Soros. Their laziness, criminal confrontations with police and love of free stuff will have them voting Democrat forever. The Democratic establishment has been pushing for open borders, welfare programs, ID-less voter registration, and financing and protection for sanctuary states for decades now. This is there to entice illegal Mexicans across the border in an effort to create a 30 million strong army of Democratic voters. That’s it. It has nothing to do with jobs or compassion; it has everything to do with creating and maintaining a criminal body of illegal voters. Their support for illegal occupation and benefits will have them voting Democrat forever. At the heart of the LGBTQ agenda is mental illness and identity disorders, yet this doesn’t stop the democrats from exploiting this group. At only a measly 3% of the population they were hardly even worth co-opting by the Democrats for political mobilization a decade ago, but thanks to Hollywood elite they have managed to create a narrative and support around the LGBTQ community that directly paints Republicans as their enemies due to their insistence of sodomite and transgenderism as being a mental-illness and a sin according to the Bible. As a result liberals have taken up the mantle, and many are mobilized to vote Democrat based on this one issue alone. This has all been taken to unforeseen heights seeing Obama abused his position as POTUS to elevate the sodomite agenda even further knowing full well Democrats would need their votes in elections to come. Woman who vote democrat do so because they are murderers themselves or murder sympathizers. While abortion is cleverly framed in terms of women’s health rights it is nothing more than a blood-pact. With over 60 million abortions performed in this country this equates to millions of women who are desperate to keep this hideous crime legally in place. If Roe V Wade were ever to be removed then they would have to face the fact that aborting their own children was a heinous crime against themselves, their babies and humanity. Instead of facing the music on this issue woman who support this crime march in Soros funded and organized rallies unified in their seared conscious. Their support of Baby murder has them enslaved and will have them voting Democrat forever. Most people have a hard time understanding why Democrats are rabid supporters of Muslims. There seemingly is no common ground upon analysis. Democrats hate religion and God, they support Woman's rights, and they also support LGBTQ rights so why the support for Muslims? It is because the Democrat elite are unprincipled opportunist and never fail to co-opt groups that they can set in opposition with Republicans no matter the obvious differences in ideology. With Obama's 8 years of bombing the Middle East and the support of ISIS he created a refugee crisis the world over, this allows for the take in of 10's of thousands of Muslims which can then mobilized against the Republicans in future elections. That is all they are good for is another group to be exploited towards voting Democrat in the eyes of the elite. Colleges and public school systems are targeted by liberal elites for institutional take over because of their proximity to large cities. All of these students are taught liberal philosophy that paints white Christian males as devils and the reason for all war, criminality of government, and corporate oppression. Everything they are taught is based in the acceptance of atheism and is in direct opposition to all religious sentiments. Their acceptance of atheism and communism makes them the perfect dupes to become riotous antifa aggressors and snowflake agitators. The last and most insidious is the use of the State Department and Justice department to rig elections, spy on their opposition, and even create false Russian hacking narratives supported by the warmongering Pentagon intel-community. The Deep State is a collective of communist imperialists that are engaged in a covert war against our Constitution. Politically Correct culture is a Democrat tool that works to self-police culture, and forbids criticism of these special groups. Those that make up these groups are made to feel special and empowered within the Democrat superstructure, but are in reality nothing more than exploited groups in mega-cities used to mobilize a vote that is equal to or greater than the rural Republican base which represents the majority of America. The use of opposition politics creates intense fear in these populations against Republicans and is sufficient in getting impoverished, under-educated, mentally ill, and illegal 3rd world refugees to vote Democrat. They are without question slaves of the Democrat party and will continue to be so until they can break free from the bewitchment of the Democrat propagandists in the DNC. 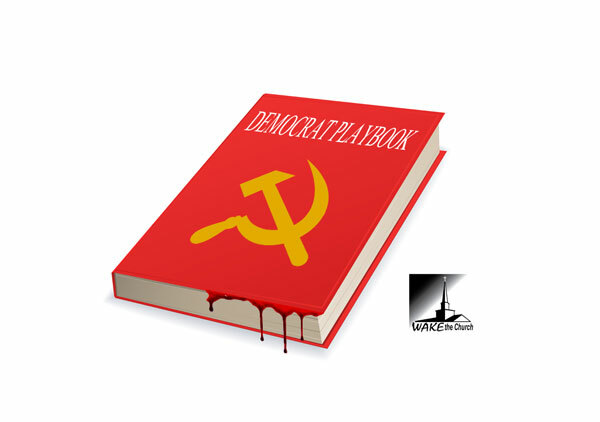 The Democrat playbook is framed in civil rights and minority empowerment but in reality it is nothing more than a clever way of scaring groups of people to perpetually vote for their candidates each election cycle. The Democrats hate God, they hate our Constitution, they hate American gun-culture, and they hate Christians. All things that are absolutely without question anti-American. This is the communist manifesto at work in our country. They are the communist color revolutionaries that have been working hard to destroy the moral fabric and the lawful underpinnings of our society for well over 100 years. Please sign-up for the Wake the Church Newsletter and Like Us on Facebook. Unless Christians and Republicans wise up to the rabid nature of this beastly ideology and their tactics we too will fall into a cycle of socialism and atheistic oppression like superpowers of the past. The Democrats are looking for dupes to aid them in the takeover of America, they leverage the populations of massive cities that they fill up with impoverished, un-educated slaves who they control and can mobilize to vote for their communist traitors in government. This verse in Psalms describes both the wicked and their covetous slaves that vote for them to a T, a verse the modern, spineless pastors in this country will never preach on as relevant to what is happening in the U.S. These weakling pastors are as much to blame as the Democrats themselves due to their cowardness.